This German chocolate cake recipe is absolutely delightful. 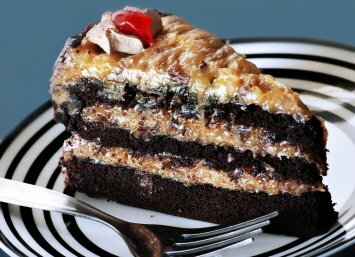 So what makes German chocolate cake different? The chocolate. Most baking calls for bittersweet baking chocolate, which has no sugar in it. German chocolate is sweeter. See suggestions below. Grease the bottom and sides of 3 round pans that are either 8" or 9" round by 1 1/2" deep. Line the bottoms of the pans with waxed paper or cooking parchment paper. Heat the chocolate and water in a 1 quart saucepan over low heat, stirring until the chocolate is melted. Cool. Beat the sugar and margarine in a medium bowl with an electric mixer on high speed until light and fluffy. Beat in the eggs, one at a time. Beat in the chocolate and vanilla on low speed. Add the remaining ingredients. Beat on low speed just until blended. Pour into two baking pans. Bake 8 inch rounds 35-40 minutes or 9 inch rounds 30-35 minutes, or until a toothpick inserted in the center comes out clean. Cool for 10 minutes then remove from pans to a wire rack. Remove the paper and cool completely. For the frosting, mix the sugar, margarine, milk, vanilla and egg yolks in a 2 quart saucepan. Cook over medium heat for 12 minutes, stirring occasionally, until thick. Stir in the coconut and pecans. Cool for 30 minutes, beating occasionally, until the mixture is spreadable. Fill the layers and frost the top of the cake with the frosting, leaving the sides of the cake unfrosted. Make sure the chocolate you are using is sweet baking chocolate, not dark. This type of chocolate cake is made with the sweeter chocolate. If for some reason you find this recipe too sweet for your liking, feel free to change the recipe a bit and use 2 ounces of German chocolate and 2 ounces of regular baking chocolate. You can find both in the bakery area of your local grocery store. For some reason, German chocolate cake is never frosted on the sides, just on the top and between the layers. And it is traditionally frosted with this coconut pecan frosting. Always ensure that your eggs are room temperature before making your cake. It makes a lighter cake. For an extra little bit of fancy, decorate the top edge of the cake with pecan halves or extra coconut and glace cherries as shown here. If you like German chocolate cake, you may want to try this moist chocolate cake too.